The Hawai’i Electric Light Company (HELCO) is seeking a new sixty-five year lease of water from the Wailuku River in Hilo from the state Department of Land and Natural Resources (DLNR). HELCO wishes to continue to use the water to operate two hydroelectric plants at lower Pi’ihonua. Under state law (HRS § 171-58(g), the DLNR and the Department of Hawaiian Home Lands (DHHL) are required to jointly develop a “reservation” of water as part of the leasing process. A water reservation is a state set-aside of water for current and foreseeable development and use, in this case by the DHHL. 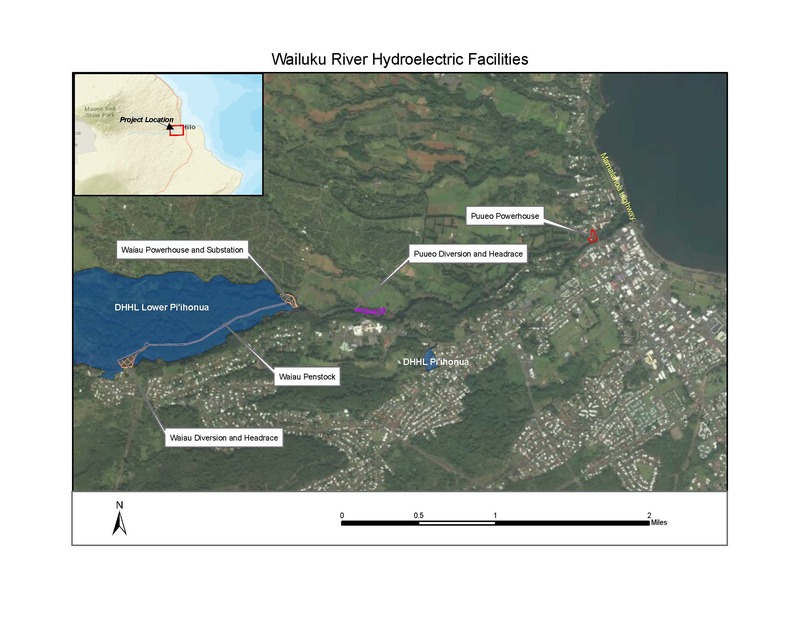 The attached map shows where the HELCO hydroelectric facilities are located along Wailuku River. 1 Proposed Action or Issue for Discussion The Hawai’i Electric Light Company (HELCO) is seeking a new sixty-five year lease of water from the Wailuku River in Hilo from the state Department of Land and Natural Resources (DLNR). HELCO wishes to continue to use the water to operate two hydroelectric plants at lower Pi’ihonua. Under state law (HRS § 171-58(g)), the DLNR and the Department of Hawaiian Home Lands (DHHL) are required to jointly develop a “reservation” of water as part of the leasing process. A water reservation is a state set-aside of water for current and foreseeable development and use, in this case by the DHHL. A Beneficiary Consultation meeting is being conducted with representatives from DLNR and HELCO regarding HELCO’s request for a water lease from the Wailuku River and DHHL’s water reservation for its lands in Lower Pi’ihonua. 2 Notification Beneficiary Consultation Letter – mailed to 2080 Hawai`i Island Lessees and Applicants on August 1, 2017. The Beneficiary Consultation Meeting is an opportunity for you to share your mana’o regarding the proposed project. Your comments will be presented to the Hawaiian Homes Commission to assist in their decision-making process. As a beneficiary of Hawai`i Island, your participation is important and we encourage you to attend the meeting. If you have any questions, please contact Kaleo Manuel in DHHL’s Planning Office at (808) 620-9481 or via email at [email protected]. Click here for a PDF (downloadable) version of the Beneficiary Consultation Notice Letter.